Forty rare early movies from the National Film Preservation Foundation capture a West both wilder and wider than High Noon, Unforgiven, and True Grit. Newsreels, travelogues, features, shorts, comedies, and home movies portray a dynamic, genderbending, ethnically diverse region. Includes The Sergeant (1910), the first surviving narrative shot in Yosemite and Mantrap (1926), a wilderness comedy with Clara Bow.10 hrs, 3 DVDs, color and B&W. Boxed with a 132-page book. The Tourists (1912, 6 min. ), Mabel Normand runs amuck in Albuquerque's Indian market. Native American in Newsreels (1921-1938, 5 min. ), Indians Invade Nation's Capitol and 4 other stories. Over Silent Paths (1910, 16 min. ), daughter avenges her father's murder. Broncho Billy and the Schoolmistress (1912, 14 min. ), America's first cowboy star courts a pistol-packing schoolmarm. How the Cowboy Makes His Lariat (1917, 3 min. ), Pedro Leon demonstrates the vaquero's art. 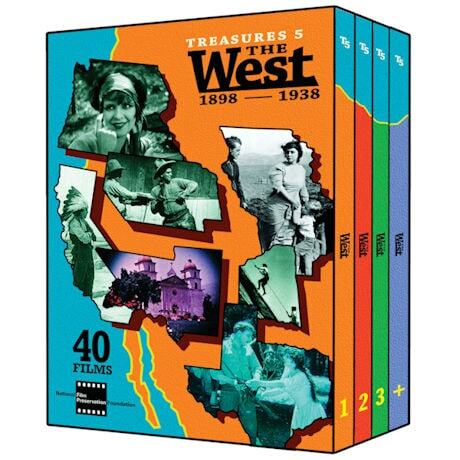 The West in Promotional Travelogues (1898-1920, 22 min. ), tours in 7 states, including Seeing Yosemite with David A. Curry.